In the Facebook group “Wynekens World-Wide” I recently posted a link to the Google English translation version of the Russian Wikipedia article for “Wyneken”. Background information: There was a George von Wyneken who emigrated to St. Petersburg in the 19th century to join his Stieglitz relative in the Russian bank business. George and his three children are the topic of the Wikipedia article. I showed the Google translation of the article to my Russian colleague at work and asked him to correct the inaccuracies in the translation, which he did. He was intrigued by the fact that I had relatives, regardless of how distant, in Russia and he kept on following links to see what he could find. He called me over to look at the article about George’s son, Alexander. He pointed out the photograph of a telegram shown on the page and translated it for me. I’m very glad he did because I found it a very interesting footnote in Wyneken history. It turns out that Alexander was some sort of attaché or envoy in Vienna, there as a representative of the government of the Russian czar. The transcript of the telegram says that the original was encrypted and that this was the decrypted version. 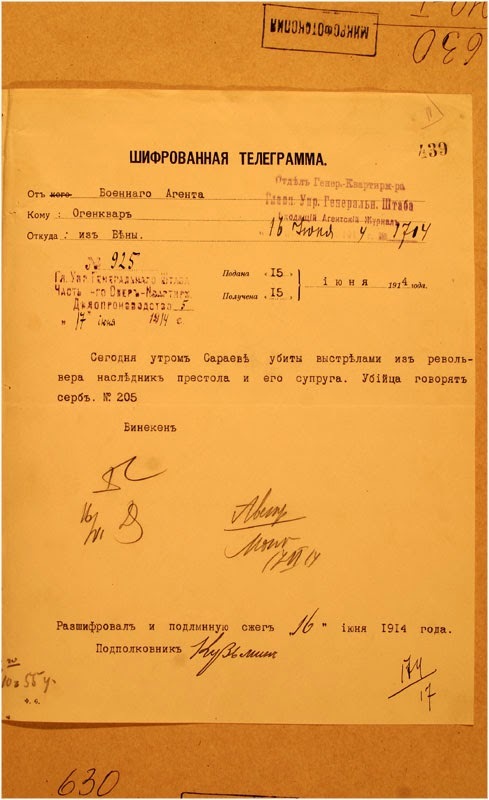 In this telegram Alexander reports back to St. Petersburg that the Archduke Franz Ferdinand of Austria was assassinated in Sarajevo. Thus, it seems that it was a Wyneken who informed the Russian court of the assassination that triggered the outbreak of World War I. This entry was posted in Uncategorized on 2015/02/17 by mpwyn.